Height: 5’ 2” Weight: 124 lbs. Skills and Abilities: Christian has displayed gymnastics abilities and a great level of agility. 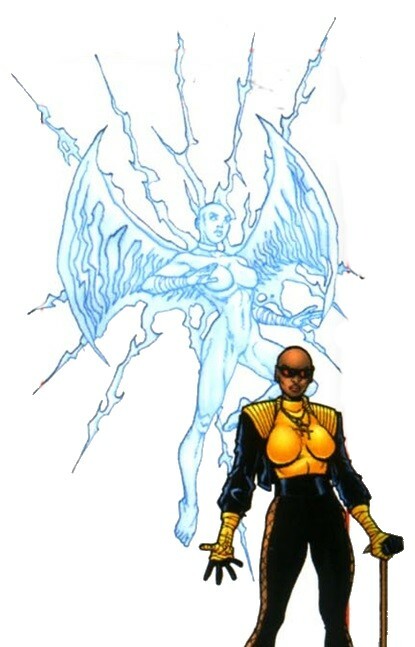 Powers: Stigmata can activate various mutant powers by vocally calling upon various saints; St. Joseph for flight, St. Barbera for superhuman strength (able to lift a ton) and St. Gabriel transforms her into an intangible angelic form with energy powers. Equipment: She carries a cane with her, which she uses as a melee weapon; calling upon Gabriel allows her to charge it with energy. When the young mutant Ana Schwartz exhibited Stigmata (marks resembling wounds on the crucified Jesus Christ) and other seemingly supernatural powers, her grandmother sold her to the Catholic orphanage. The Vatican soon recognized her potential and recruited her into the Holy guard, who protected the Vatican and its wealthy patrons, but she eventually left to join the altruistic Jesuit Sect “Holy Fire”. She was assigned to serve as the bodyguard for San Gregarian President Franco Santera, who claimed to have turned to God and repented for his tyrannical past; she was also tasked with determining if his conversion was genuine. Santera’s visit to the Bronx’s St. Jude church was interrupted by a terrorist squad, led by the cyborg Teraknid (Aurelio Santurce), hired by Santera to make his repentance look real. Stigmata took out several terrorists, but Teraknid paralyzed her with his poisoned sting, and she was bound and gagged, preventing her from activating her powers. The situation deteriorated, exacerbated by the intervention of federal agent Venom (Eddie Brock) and the vigilante Ghost Rider (Dan Ketch), and Santera tried to kill all the witnesses; in the ensuing confusion, a nun removed Stigmata’s gag, allowing her to call upon the angel Gabriel and activate her powers. She distracted Santera, allowing Ghost Rider to administer his soul-searing Penance Stare. Stigmata then took custody of Santera and delivered him to a secret Vatican Prison [Official Handbook of the Marvel Universe A to Z Update 4 ,2010].